Free Shipping Included! 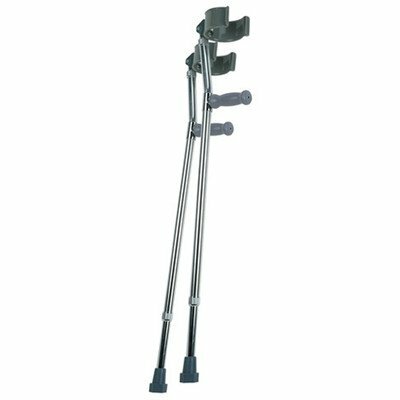 Lumex 6341A Deluxe Forearm Crutches, Large, 1 Pair (Pack of 2) by Lumex at Bijc. SKU: GRF-6341A. MPN: 6341A. Hurry! Limited time offer. Offer valid only while supplies last. Leg and forearm sections can be adjusted independently for a custom fit. Vinyl-coated arm cuffs can be shaped to the user's arm for extra comfort. Leg and forearm sections can be adjusted independently for a custom fit. Vinyl-coated arm cuffs can be shaped to the user's arm for extra comfort. Contoured vinyl handgrip is durable and comfortable. Telescoping parts have internal bushings and external lock nuts to silence any noise. Extra-large, non-skid crutch tips provide added traction and stability. Constructed with high strength aluminum tubing. Easy push-button height adjustment with locking collet for added security. Grip-to-floor height adjusts in 1" increments.